Magic: the Gathering, flagship title in the world of collective card games, stalwart veteran of the tabletop gaming culture and now in its 23rd year and boasting well over 20 million players worldwide. Magic is definitely the defining archetypal geeky card game. Currently, it’s a very exciting time to be a Magic player, as the lore (yes there’s a story, you philistine!) has brought us back to the plane of Innistrad, a grim, gritty, low fantasy setting full of Angels and Vampires and Werewolves (oh my!). Today, we are exactly one week away from the official release of the latest set of MtG cards, Eldritch Moon. Now, this is the second set in the Shadows over Innistrad block, which follows on directly from the Battle for Zendikar block both sequentially and with the story. 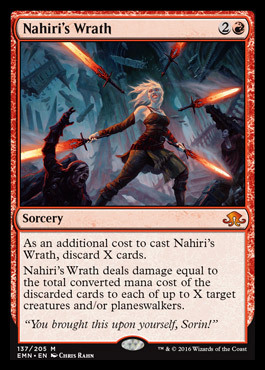 In her rage, and through various other means (including secret evil cults, proper Cthulhu style), Nahiri manages to summon Emrakul, the biggest, meanest, slitheriest of the Eldrazi titans, to Innistrad. 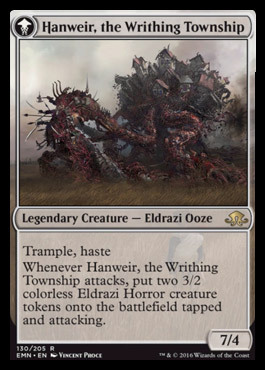 Now, the whole idea behind the Eldrazi is that they absorb and corrupt the mana of the plane they’re in, warping the realities around them. This has had quite the dramatic effect on the land, with the angelic “Flights” becoming corrupted and horrible, now forming the singular Flight of Nightmares. Townsfolk and beasts alike have also become corrupted and, well, tentacley. It’s now up to Sorin and the assembled members of the Gatewatch (the hero Planeswalkers from Zendikar) and Liliana, necromantic Planeswalker of low morals and lower necklines, to stop the squiggly mass of nasty that is Emrakul, along with the help of Tamiyo, another Planeswalker from the plane of Kamigawa (Feudal Japan, with magic and monsters, super cool!). So what does this mean for Magic as a game? Well, it is going through a transitional period at the moment. The current major format of Magic (known as Standard) has seen a change in its rotation of what cards can and can’t be used, and this new block of BfZ and SoI are the first of the new two set blocks. You’ll notice that that these two cards feature the new Meld mechanic. They also both have the Transform icon in the top left corner of the card, indicating that these cards are double sided, the Transform mechanic being first brought into the game with the first Innistrad set. Both of these cards operate individually, but once the requirement has been met to Meld the two of the together, both cards are flipped and both cards have half of the Meld card on their reverse. Imagine that on a postcard. Strong, can attack straight away because of its Haste rule, and makes more creatures whenever it attacks. Meld seems to be a very interesting mechanic, with some very powerful creatures that it gives a player access to, but whether it’s simply a gimmick of the set or if it will actually see some competitive play remains to be seen. 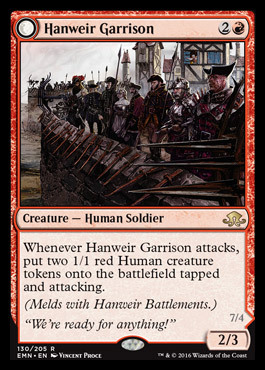 The second new mechanic in this set is called Emerge. 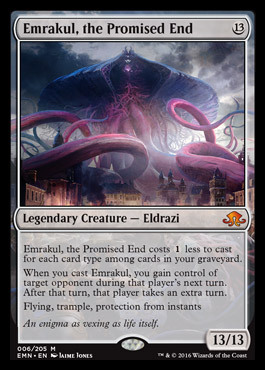 Emerge is designed to represent the corruption of the Eldrazi completely overtaking a creature and bursting forth from them into something new and horrible, like a Xenomorph, or the morning after a potent curry. Those of you familiar with Magic will notice that these cards have two mana costs. The first in the top right corner and the second in their effect text. You can either play these creatures normally or you can have them Emerge by sacrificing another creature to count towards the mana cost of the Emerge beastie. These creatures then also have effects that trigger when they enter the battlefield or otherwise do equally nasty things. 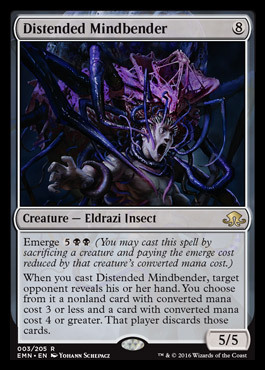 This example in Distended Mindbender is particularly horrible because it makes an opponent get rid of cards from their hand, potentially ruining their strategies. This weekend sees people across the world playing in Prerelease events for Eldritch Moon with the set becoming officially released and tournament legal worldwide next weekend on the 22nd of July. I personally can’t wait to sink my teeth further into the juicy plot of the Innistrad plane. Until next time, I’ve been and shall remain Craiggy. Magic the Gathering and all images presented in this article are courtesy of Wizards of the Coast.